. In 1866 the lake represented both a weak point in the Quadrilateral's defenses, as enemies could slip across and cut communications to Tirol, and an advantage once steam power allowed rapid movement up and down the lake. During the years preceding the 1866 war the Austrian navy added a major contribution to the area's defenses, establishing a powerful flotilla of steam-powered screw gunboats on Lake Garda. The Garda flotilla saw little action during the 1859 war against France, and afterward Kaiser Franz Josef, on the suggestion of his brother Archduke Ferdinand Max, the navy commander, removed all the flotillas from army control and united them with the rapidly expanding navy. With imperial patronage, the Garda Flotilla also began to grow enormously in size and fighting power. By the time war approached in 1866, the small fleet on Lake Garda had six modern screw-driven gunboats, Wildfang, Raufbold, Wespe, Uskoke,Scharfschütze and Speiteufel, all laid down at Peschiera in 1860 to replace several sail-powered gunboats. These were somewhat smaller versions of the Gemse class gunboats operated by the "blue water" navy, which gave good service in 1866 patrolling the rough shoreline and many islands of Dalmatia. 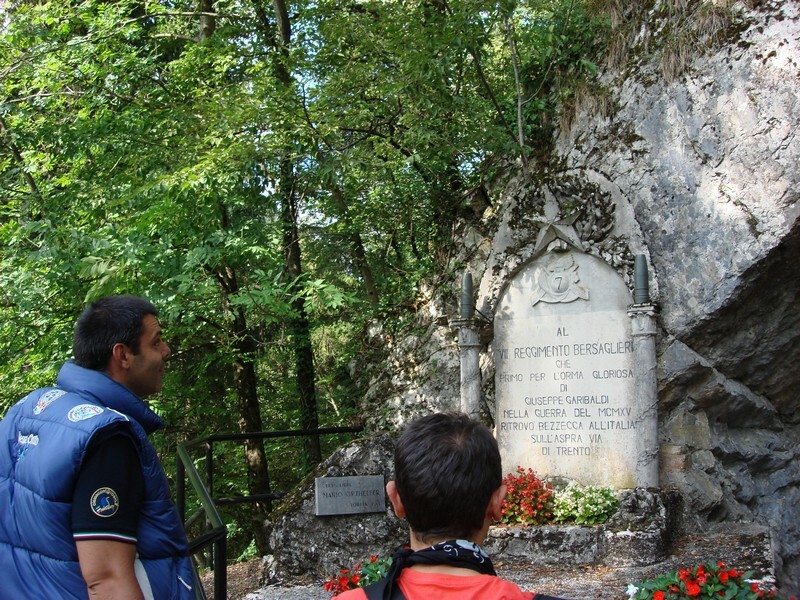 kaiserjager, these soldiers fought in the Alpine areas and Lake Garda. Each gunboat carried two obsolete 48-pounder smoothbore cannon and two short-barrelled 30-pounder smoothbores. Plans were in the works to re-arm all the gunboats with the modern Wahrendorf 24-pounder breechloading rifles then entering service with the Adriatic fleet's big ironclad frigates, but by the time war broke out only Speiteufel had received these guns. The Garda Flotilla's re-armament apparently had priority even over the high seas fleet; the two newest ironclads fought at Lissa with 48-pounders rather than the more modern pieces for which they had been designed. A single gunboat armed with four modern naval cannon might have been able to dominate the small Alpine sea; six of them definitely represented a case of overkill. The squadron also had two armed paddle steamers left over from the pre-Maximilian era,Franz Josef and Hess. 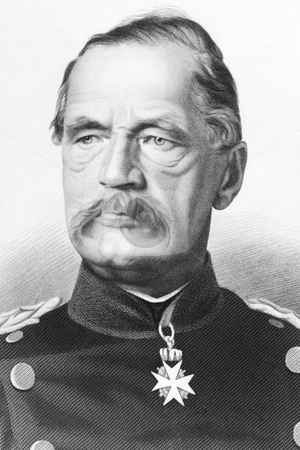 Franz Josef carried two 12-pounder rifles, while Hess mounted four of them. A pair of armed barges at Peschiera for use as floating batteries, a half-dozen unarmed sailboats for scouting purposes and the 3rd Marine Infantry Company stationed at Peschiera rounded out the tiny fleet. Though the Garda Flotilla fell under the navy's oversight, this control seems to have been fairly nominal; orders issued by army officers to the flotilla appear throughout the period leading up to the war. The commanders at Peschiera and Venice looked to Southern Army headquarters for funding to overhaul and man their craft in preparation for war. In late April, as part of the stream of orders mobilizing Austrian forces along the southern rim of the monarchy, the Garda Flotilla came under Southern Army's operational command, receiving its orders at first from Ludwig von Benedek and then from Archduke Albrecht (as did, on paper at least, the Adriatic fleet led by Wilhelm von Tegetthoff). Maj. Gen. Karl Baltin, commandant of the Peschiera fortress garrison, asked permission to make the gunboats "ready for sea" in late April. Shortages of funds and especially manpower delayed the work until formal mobilization made more cash available. In mid-May the gunboats entered Peschiera's workshops for the same modifications the Adriatic fleet's wooden ships were then receiving. Sailors and blacksmiths fitted railroad iron and heavy chains over the gunboats' machinery spaces and magazines to give some measure of armor protection. below Italian admiral Persano Just how many of the gunboats received this modification is unclear. The Southern Army Order of battle lists only Speiteufel and Wespe as "armored." The Austrian official history states that all six received the makeshift armor, all over a period of five days. More likely only Speiteufel and Wespe received protection along the waterline at the same time they were re-armed with 24-pounder rifles, while the others were fitted with rails to cover their vital spaces. Raufbold, which did not see nearly as much action as her sisters, probably spent more time receiving the modifications as well. Baltin began issuing instructions to Manfroni even before the new flotilla commander arrived at the mountain lake. The gunboats were to mount a steady patrol along the lakeshore to prevent Italian volunteers — Garibaldi's men, though like most Austrian officers Baltin hesitated to speak or write the Red Shirt leader's name — from crossing into Austrian territory. Manfroni and his gunboat commanders were not to await a legal state of war between Austria and Italy, Baltin wrote. Any boats spotted on the Austrian side of the boundary line running down the center of the lake were to be stopped and searched. In particular, Manfroni was to stop boats with large numbers of men aboard or those carrying weapons. "Under no circumstances," added Baltin, "through a confrontation, are grounds for a casus belli to be given." Manfroni accordingly sent out Linienschiffslieutenant Julius Joly and the gunboat Wildfangon a cruise down the center of the lake, keeping to the lower, wider part of the inland sea. Manfroni attached a copy of Baltin's instructions to Joly's written orders, cautioning the gunboat commander that he would be held personally responsible for any incidents. Joly was authorized to requisition any craft he found on the Austrian side of the lake which he considered suspicious, and to destroy any craft containing Garibaldini. Wherever possible, Joly should use small-arms fire rather than bring his main armament into action. If Garibaldini got past Wildfang and landed in Austrian territory, Joly was to raise all possible alarm to bring troops and gendarmes to stop them before they melted into the countryside. The gunboat was not to cross into Italian waters, nor to allow any shots fired to fall there. Wildfang, like the gunboats which relieved her in four-day shifts, caught no Red Shirts. In early June Manfroni and Speiteufel ran across a group of 40 people attempting to leave the monarchy's borders. After subjecting them to what Manfroni described as "casual questioning," the Austrian sailors allowed them to pass on to the Italian side of the lake. Manfroni noted that Speiteufel's signals for assistance seemed to have been noticed only by the Italian gunboats cruising along the lake's western shoreline. The Italian Garda flotilla came under army supervision, its boats manned by regular army soldiers. Tactically the flotilla came under the command of Garibaldi's 2nd Brigade. The Italian squadron on Lake Garda numbered five gunboats, each armed with a single 40-pounder rifled cannon. Much smaller than the Austrian vessels, they most likely lacked the ad-hoc armor protection of the Habsburg gunboats (Italian wooden ships of the blue water navy received no such protection). The British Capt. W.J. Wyatt describes the Italian gunboats as "ironclads," but no other sources agree. The Italian gunboats had just received new boilers and were thought to be considerably faster than their enemies. The fleet was led by an army lieutenant colonel named Elia. 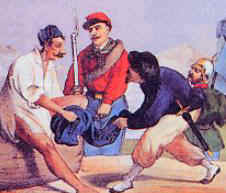 The Italian Garda squadron also included its own organic company of light infantry, the "Cacciatori di Garda," and once war broke out more ground forces were attached, including the 1st Battalion of the 10th Volunteer Regiment from Garibaldi's corps and a detachment of seven heavy guns. The Italians gathered as many sailboats and other small craft as they could find and concentrated them at their base at Salò at the southwestern corner of the lake (better known today as Mussolini's final redoubt) for possible use in projected amphibious assaults across the lake. 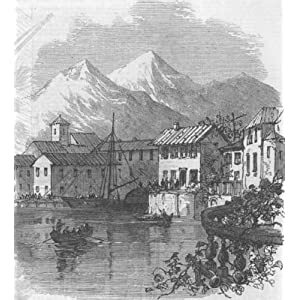 Albrecht warned the flotilla of impending hostilities on 17 June, and instructed FML Friedrich Ritter Jacobs von Kanstein, the garrison commander in Verona, to lay a new telegraph line from Pastrengo north of Verona to San Vigilio, a village on the eastern shore of Lake Garda. On the 20th, Manfroni, citing "special intelligence" sources, informed his gunboat commanders that he expected the Italians to seek a battle between the two lake flotillas. The battle would serve to cover a landing by Garibaldi's Red Shirts at as many places as possible on the Austrian shore of the lake. To counter this move, Manfroni planned to keep two gunboats and the two steamers on patrol and the other four gunboats ready in reserve. The four craft out patrolling the lake would pursue the Red Shirt landing craft and attempt to destroy them before they could disgorge their troops. The other four gunboats were to engage the Italian flotilla. "The Italian warships are a trivial matter," Manfroni wrote. "By all means seek the greatest possible destruction of the volunteers." Manfroni made his point regarding the Red Shirts very clear: "Especially against volunteers who have abandoned their ships," he wrote, "shoot them at close range with canister shot." The flotilla commander wrote that he understood the difficulties this raised with his officers' personal honor, but that he expected them to understand in turn the enormity of their task. "Fortress Peschiera cannot fall," he wrote, "As long as we remain masters of Lake Garda and our communications with the interior of the empire are secure, as long as we hold our positions and prevent the A French Cacciatori officer 1860 landing of the volunteers." When the war began the Austrian flotilla patrolled very aggressively, showing themselves off Salò in the days leading up to the Italian invasion of Venetia. On 23 June all six gunboats scouted the Italian side of the lake, trading a few shots with the batteries at Maderno. Manfroni hoped to determine the position of the Italian batteries and the range and caliber of their guns, he reported. The Austrians also hoped to lure the Italian flotilla out for an engagement, but the Italians would not cooperate. When the guns opened fire, the Austrians found them to have enormous range — 1,500 fathoms, or roughly 3,000 meters. This allowed to battery to reach halfway across the mountain lake. Judging from the explosions, Manfroni wrote, these were very large-caliber guns. They also sported very good crews: the third shot fell between two Austrian gunboats. These were, Manfroni wrote, no mere volunteer irregulars. The flotilla suffered no losses, but claimed no damage inflicted on the Italians, either. "Very many Garibaldini" already occupied the lake shore, Manfroni reported. While the Southern Army grappled with the Italians at Custoza on the 24th, the flotilla once again prowled off the Italian shore, subjecting Maderno to another round of shelling. Albrecht did not include the Garda Flotilla in the plan for his attack at Custoza, despite the key advantage of mobility across the lake provided by Manfroni's gunboats: since the great Radetzky had no flotilla during the 1848 campaign, his disciple Albrecht simply ignored the flotilla in his own strategic planning. The steamer Hess, commanded by Linienschiffsfahnrich Julius Seyssel d'Aix, served as the flotilla's advance guard, scouting the Italian side of the lake on 29 and 30 June. Reports of new Italian batteries under construction along the lakeshore had reached Peschiera, and Manfroni was determined to destroy them before their guns became operational. Hess found no signs of such activity. While the steamer patrolled the lakeshore, Manfroni and his gunboats continued their blockade of Salò, while the Italian flotilla made no move to challenge them. 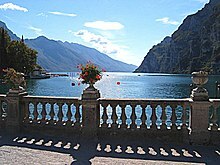 At the small town of Limone, on the Italian side of the lake about seven kilometers south of Riva and the site of the purported battery, members of the local government trooped aboard the Hess for a visit. The distinguished burghers, Austrian subjects until seven years previously, hurriedly produced a certificate left them by Oberlieutenant Reimisch of the 11th Infantry Regiment, part of the Austrian corps guarding the approaches to South Tirol. This officer had led a strong patrol of regulars and Standeschützen from the Innsbruck City Company through the pretty lakeside town the day before. Reimisch reported the natives friendly and pronounced their beer good, and the villagers apparently hoped this would spare them bombardment. The next morning, Hess steamed on down the lake, spotting three Italian gunboats escorting a paddle steamer. Hess summoned the gunboat Wildfang — which shadowed Hess within signaling distance throughout the scouting mission — and the Italian vessels scurried into the harbor at Salò while the heavy battery fired several shots at Wildfang. Unable to come to grips with the enemy, the steamer continued along the lake's southern shore, where the Austrians found the Sirmione Peninsula unfortified and unoccupied. A narrow tongue of land jutting some four to 4-1/2 kilometers into the lake — and sporting a Scaglieri-built castle on its tip — the peninsula dominated the southern part of the inland sea. 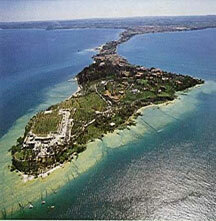 On a plateau just east of Desenzano, Hess's lookouts spotted about 400 Garibaldini formed up for military exercises. She flung four shells at the volunteers and called for reinforcements, but the Red Shirts scattered before the gunboat Speiteufel and her much heavier artillery arrived. Once Southern Army began its limited advance into Lombardy, Albrecht briefly stationed his headquarters in Peschiera and seems to have finally realized the potential uses of the flotilla. Two gunboats, under Manfroni's personal command, screened the right flank of the Austrian advance and scouted along the southern and western shores of the lake for enemy activity. On 1 July Manfroni and Speiteufel returned to Desanzano under orders to seek out magazines and other war material being gathered for Garibaldi's corps. The Austrians found that the Garibaldini had also come back to the same field where the steamer Hess had rudely interrupted their drill the day before. The volunteers had pitched their camp almost on the edge of the lake, allowing the gunboat to approach within a few dozen yards, apparently unseen by the Red Shirts. The Speiteufel unleashed a barrage of close-range canister shot on the volunteers, again sending them into headlong flight (Albrecht reported that this bombardment inflicted grievous losses on the Garibaldini, but Manfroni only claimed to have inflicted losses, with no estimate of how many, in his own report of the incident). Manfroni reported that he had no marines to aboard send ashore to destroy the weapons and supplies abandoned by the Red Shirts. The volunteers seemed to be digging in to face a frontal assault from Peschiera, Manfroni reported. These volunteers, despite their distinctive Red Shirt garb, appeared far better equipped and disciplined than those encountered along the western lake shore. The infantry carried modern military rifles tipped with long bayonets, the officers were mounted and a horse-drawn artillery battery was also seen. The gunners made no attempt to fire at the gunboats. The gunboat then continued its cruise and came across another column of volunteers marching from Padenghe to Desanzano. The column broke up under heavy fire from the gunboat. Once again the volunteers suffered heavy losses against no damage to Speiteufel or her crew. Three Austrian gunboats continued the blockade of Salò during the operation, but the Italian flotilla did not attempt to interfere with the Austrians. Even facing 5:3 odds, the Austrians maintained a serious advantage in fighting power. Two days later the Austrian gunboats found a column of Garibaldini marching through Gargnano and shelled them as well. The volunteers did their best to retaliate for the harsh treatment, and set up a sophisticated operation to attack the Austrian gunboats in detail. On 6 July, Joly and Wildfang fell into an ambush laid by the Garibaldini at Gargnano, Nel luglio del 1866 una nave austriaca, prese a cannonate il paese, occupato dai volontari di Garibaldi; nel porto, sulla facciata di alcune case sono ancora murate varie palle di cannone sparate in quell' occasione. Fra gli ospiti illustri del paese di Gargnano, ricordiamo lo scrittore inglese D.H. Lawrence. a lakeside town about midway along the western shore and just beyond the range of the battery at Maderno. As the gunboat slowly cruised past the town just as dawn broke, Joly and his crew noticed that the houses and the lemon groves seemed deserted. Something, first officer Linienschiffsfähnrich Otto Burian told his commander, was not right. Suddenly, Red Shirts appeared from their hiding places and wheeled out either seven or nine cannon. Two of the cannon were big, long-range pieces apparently taken from the Maderno battery, and Joly was not sure whether his lookouts counted these pieces in their total. The Garibaldini had placed their guns at exactly the right position and range to destroy the gunboat, Joly reported. The regular patrol routes of the Austrian gunboats had apparently been noted by the Red Shirts. A furious firefight developed, with the gunboat and the Red Shirts trading shots for the next 30 minutes. Of the 100 or so shots fired by the Garibaldini, two hit the gunboat. One shell lodged in the gunboat's hull without exploding, while another carried away her boat crane. More severe damage came when the firing pin broke onWildfang's portside 48-pounder — no small problem on a warship with a two-gun broadside — and the gunners had to scavenge a replacement from one of the unengaged cannon on the opposite battery. The gunboat in turn fired about 40 shots, concentrating on two field guns set up near the town's pier. The town center received some "not meaningless damage," Joly reported, but the Garibaldini did not appear to suffer any losses, he admitted. The gunboat steamed away without further loss on either side. Joly's repair crew found that the gunboat had been hit by a pointed, steel-capped projectile from a 6-pounder or perhaps 8-pounder rifled field gun — an early attempt at an armor-piercing round. Several of the rounds fired by Wildfang remain lodged in the walls of Gargano's town hall today, along with a small plaque commemorating the gunboat's visit. At the same time that Joly's gunboat dueled the volunteers' batteries, all five gunboats of the Italian squadron sortied to challenge the gunboat Wespe, then on patrol near Maderno. The Italian 40-pounder rifles outranged Wespe's smoothbores, and the Austrian gunboat reacted by charging her attackers to close the range. The Italian gunners widely overshot Wespe. Manfroni with Speiteufel and Scharfschütze raced to join Wespe at the first sound of cannon fire, and the Italians turned back for the safety of Salò and its batteries. The Austrians did not challenge the port defenses. Manfroni kept all three gunboats out all night, watching for any movement across the lake now that the Italians had suddenly become aggressive. Coal stocks at Peschiera were already falling dangerously low, just as activity on the lake began to increase, and re-supply seemed unlikely at best. Peschiera became less of a safe haven for the Austrian flotilla once the Italian field army re-entered Venetia. The gunboats usually anchored near Point San Vigilio, a promontory on the Austrian side of the lake with a commanding view. Manfroni and his captains datelined their reports there, but despite Albrecht's new telegraph line they often sent their telegrams from Peschiera using civilian lines and operators, apparently without any security breaches. 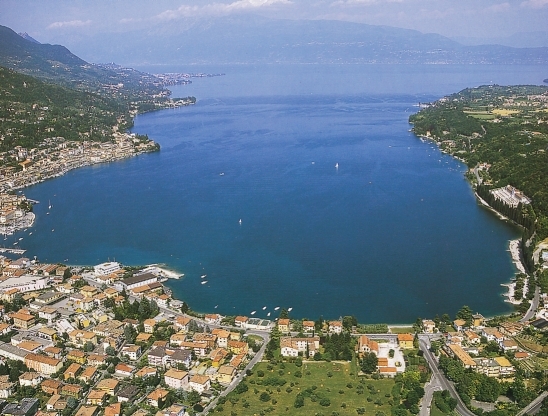 By mid-July Peschiera was almost out of coal anyway, so Manfroni moved his vessels to Riva di Garda, a resort town at the northern end of the lake. Though the town was not normally a naval base, it served as Austrian headquarters for defense of the South Tirol. The Austrian gunboats do not seem to have had any trouble obtaining sufficient coal there. The gunboats normally consumed very little fuel, as much of their patrol duty could be performed under sail power, but would require steam power for battle or rapid movement. As the Italian offensive into South Tirol began to make progress, the Italian lake squadron became more active. The Austrian flotilla now faced the very real threat of seeing all of its potential bases either fall to the Italians or come within range of enemy artillery fire.